President Moon Jae-in on Sunday tapped Kang Kyung-wha, a special adviser to UN Secretary-General Antonio Guterres, as his foreign minister. Kang (62) told the Chosun Ilbo, "The president has appointed me to such a significant post, so the only thing on my mind is to do my best." Currently in Geneva, Switzerland on UN business, she added, "I need a little bit of time to gather my thoughts on various issues. I've lived overseas for 10 years working for the UN, so I intend to return to Korea as soon as possible after I go back to New York." Kang would become Korea's first-ever female foreign minister if her appointment is confirmed by the National Assembly. Born in Seoul in 1955, Kang lived in the U.S. from 1964 to 1967 when her father, former KBS announcer Kang Chan-son, was sent to work for Voice of America. She graduated in political science from the prestigious Yonsei University and worked as a producer for English-language programs at KBS from 1977. She then went to the U.S. again to study with her husband and completed a PhD in communications at the University of Massachusetts. She worked as an interpreter for President Kim Dae-jung and became the first official to join the Foreign Ministry without taking a foreign service exam in 1999. She was appointed UN deputy commissioner for human rights in September of 2006 under Secretary-General Kofi Anan, the highest position for a Korean woman at the global body to date. She then served as assistant secretary-general at the UN Offices for the Coordination of Humanitarian Affairs under Secretary-General Ban Ki-moon from 2013. 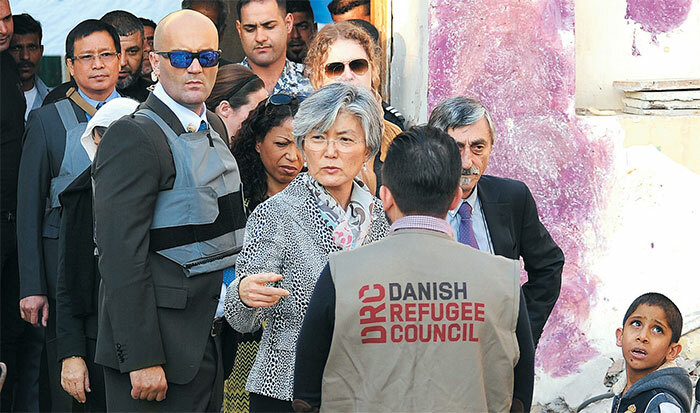 Guterres appointed Kang a special aide for policy in December of last year as she was preparing to return to Korea. Diplomats who have worked with Kang said her track record at the UN speaks for itself, but critics voiced concerns over her extended absence from Korea. She has no particular experience in dealing with the North Korean nuclear crisis or handling relations with the U.S., China and Japan. Moon also tapped as finance minister Kim Dong-yeon (60), a nonpartisan university president and expert in fiscal and economic policy. And he appointed former lawmaker Chung Eui-yong (71) as national security adviser at Cheong Wa Dae. What is noteworthy is how many officials Moon has tapped who have worked with his political rivals. The nominee for finance minister had worked for former presidents Lee Myung-bak and Park Geun-hye. Kang worked under Ban, who made a brief bid for the presidency in the conservative camp earlier this year.